A winner of the National Association of Landscape Professionals’ (NALP) 2016 Best of the Best Award, Curby’s is located in Gardner, Kan., and was founded in 1984. It’s been awarded NALP’s Overall Safety Achievement in Gold Award for three consecutive years (2014, 2015, 2016), with additional gold awards in 2007 and 2011, according to NALP. Other safety awards from NALP include one bronze and four silver Overall Achievement Awards and eight Triple Awards (no injuries and illnesses, no days away from work and no vehicle accidents), among others. The company employs up to 30 crew members and offers 85 percent design/build and installation, 15 percent irrigation and water management services to an 80 percent residential, 20 percent commercial clientele. Craig, who has served as safety manager since 2004, adds safety has always been a top priority for the company. “Curby himself has always stressed that safety is our No. 1 thing,” he says of the company’s owner, Curby Hughes. To ensure all employees—new and seasoned—are on the same page, Craig leads a mandatory safety meeting each month. If a crew member is unable to attend, the company arranges to discuss the information with him at a later date. Typically lasting about 30 minutes on a Wednesday morning, each meeting takes place in the company’s conference room, with a hands-on demonstration in the field afterward, depending on the meeting’s topic. Drug and alcohol awareness, complete with a warning that drug or alcohol use on the job is terms for automatic dismissal. Craig chooses topics from information he receives from industry magazine articles, Kansas State University (KSU), NALP and gas and electrical companies, among others. During each meeting, he passes out a handout, with the relevant safety information written in English and Spanish. The handouts are already translated into Spanish by the source organization, such as KSU, NALP or industry magazines, when Craig receives them, but Curby’s has two bilingual management staff members if further clarification is needed. At the meetings, Craig also addresses any safety-related problems that have cropped up within the past month. “Crews are on board with safety measures, and they take an interest in not wanting to have an injury,” Craig says. He says employees are not offered additional incentives for safe behavior, mostly because crews have learned to demonstrate such behavior on their own. In addition to the monthly meetings, select staff members attend an annual meeting about digging safety, put on by Dig Safe, a nonprofit clearinghouse that notifies participating utility companies of contractors’ plans to dig. 811 is the phone number contractors can call before planning to dig. Other safety initiatives include supplying each crew member with proper personal protective equipment, including gloves, ear plugs, a reflective safety vest and two pairs of safety glasses—clear and tinted. 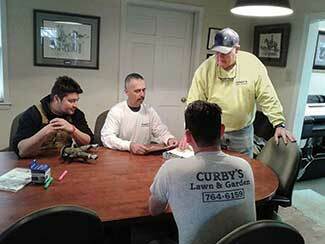 Curby’s also provides crews with coolers filled with water, especially during hot summer months. For landscape companies hoping to improve their safety records, Craig’s advice is to consistently communicate with crews about safety. For more tips to create a winning safety culture, check out our May cover story.